Gun reform organization Change The Ref is raising awareness about 3D-printed guns with 3D printing technology of its own—a 3D-printed sculpture the group is calling “the first 3D activist” in a campaign created in collaboration with the agency Alma. The sculpture is modeled after Joaquin Oliver, Marjory Stoneman Douglas shooting victim and son of Change The Ref founders Manuel and Patricia Oliver. Entitled “Guac is Back,” the campaign is centered around a 3D sculpture of Joaquin holding a bouquet of flowers, in tribute to the Valentine’s Day gift for his girlfriend he was holding when he died. The statue of Joaquin is wearing a pin which, when scanned with a smartphone, directs viewers to a website collecting signatures for a petition demanding action against 3D-printed guns and encourages visitors to register to vote. Alma executive creative director, content lu la Lueta explained that the agency decided it wanted to do something around the issue of 3D-printed guns after realizing how easy it was to download plans for them. Alma senior art director Jonathan Garcia explained that the process of creating the statue included scanning Joaquin’s clothes and accessories, as well as video footage and images, to arrive at a 3D image that felt true to life and captured his personality. The agency utilized 3D artists, photographers and directors during the creation of the campaign and worked with Brooklyn 3D-printing company Voodoo Manufacturing. 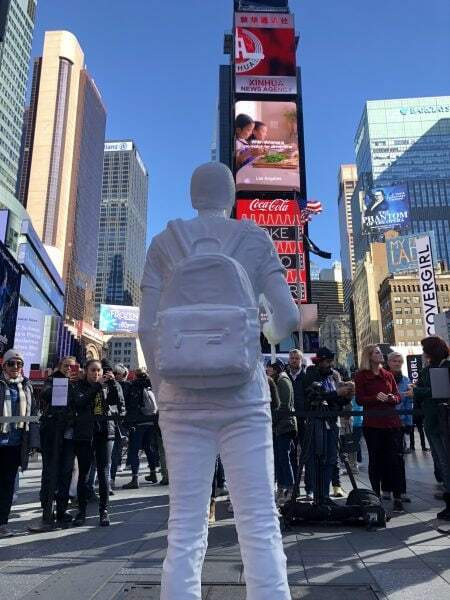 The 3D-printed statue will be in Times Square today, Oct. 25, from 11 a.m. to 1 p.m., before joining a series of other gun reform protests and events around the country in the coming weeks. 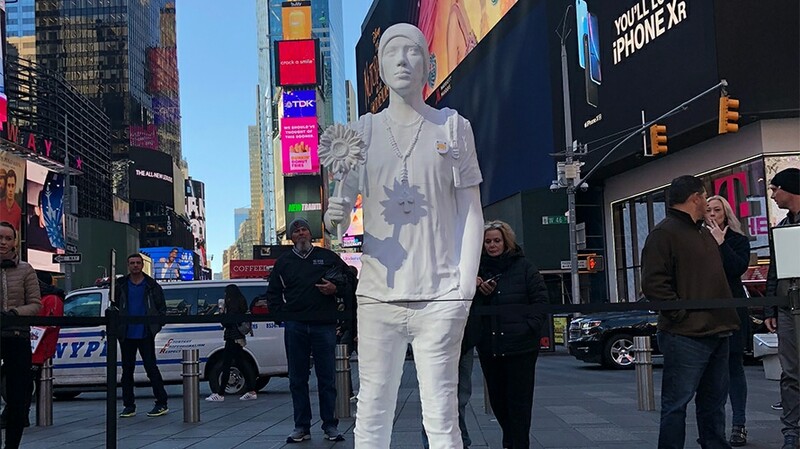 The campaign follows Change The Ref’s “The Last Lockdown,” which featured a statue created in collaboration with a group of Texas creatives and the Giffords Organization. “Guac is Back” also follows April’s “Posts Into Letters,” created with Area 23, which transformed social media posts into handwritten letters to members of Congress, using Joaquin’s handwriting. Another key difference is the emotions displayed by the subjects of the different sculptures. While the girl in “The Last Lockdown” is fearful and tormented, Joaquin “is not afraid, he’s very powerful,” Oliver explained. “Me and Patricia wanted it this way. He’s confronting people,” he said, adding that the sculpture is clearly a 3D-printed object, unlike the bronze-finished “The Last Lockdown” statue cowering under a real desk. “It really shows the process of the 3D printing behind it, which is very important when you want to fight … 3D-printed guns,” he said. “It’s not an easy thing to do, to just go ahead and print your dead son on a 3D printer,” Manuel Oliver told Adweek. Oliver explained that the location of the “Guac is Back” unveiling had both strategic and personal significance for Change The Ref, himself and his wife. Oliver personally chose New York after Alma initially suggested that the campaign launch in Parkland, Fla. The timing of the effort was arguably even more important. He said that he’s “totally convinced” that the outcome of the elections will show that the country is demanding changes around issues related to gun violence, comparing the trajectory of support for the NRA to that of the tobacco industry. Following the unveiling of “The First 3D Printed Activist,” the campaign will continue through a social media component centered around the “#GuacIsBack” hashtag. Change The Ref has a series of other events planned in the lead-up to the Nov. 6 midterm elections, including an online campaign the group plans to launch tomorrow or Saturday, a billboard reveal in Boston on Nov. 1 and a wall installation in Washington, D.C.